Step one, determine what is out of alignment. As mentioned in the previous post, there are a few different things that can be out of whack. Based on my pictures Sarah, I was fairly certain that the viewing lens and the taking lens were out of alignment, but had no clue about the distance scale. But this is easy to check. Lets start with close focus. The simplest test one can do is to compare the viewing lens to the distance scale. I set up a few objects at set distances from the film plane, 90cm, 1 meter and 1.1 meter (distances that are on the distance scale). I focused on the objects and then checked the scale to see if it matched... nope. So I knew that the viewing lens and the distance scale were misaligned. Checking the taking lens is slightly more involved. First you will need a piece of ground glass (or plastic in a pinch) that fits on the guide rails or rollers on the back of your camera. Around 69mmx75mm is ideal, the exact size is not so important, the main thing is that it fits on film plane well. For info about grinding your own glass check out this article by Ian Grant. 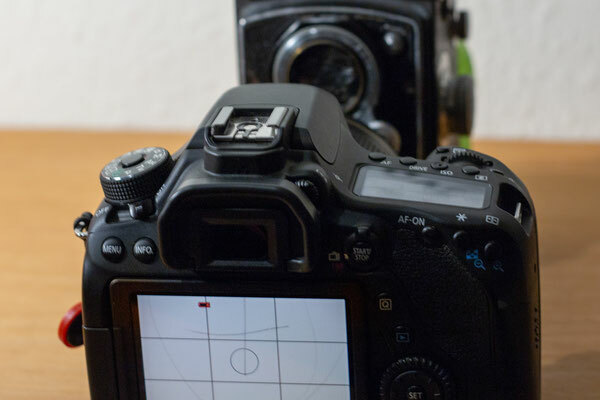 Now remove the back plate from your camera (or open it if yours can't be removed easily) and attach the ground glass to the film plane, with the ground side facing the lens. I used some masking tape to hold the glass in place. Set your aperture wide open, and the time to bulb. Use a locking cable release or the built in catch to open the shutter and hold it open. Now when you look at the ground glass you will see an upside down image projected by the taking lens. Use a loupe to aid with adjusting focus, and it helps to have the objects you are focusing on well lit and the camera in shadow, you can also focus on a laptop screen or something similar that produces light. Check the focus distance again and compare it to the distance scale. Mine was also out of alignment. Testing infinity focus is also fairly easy. For this I use my digital camera with an 85mm but any longish lens will do fine as long as it has a physical focusing scale. Set the lens to infinity, and aim it right into the lens you want to test on the TLR. 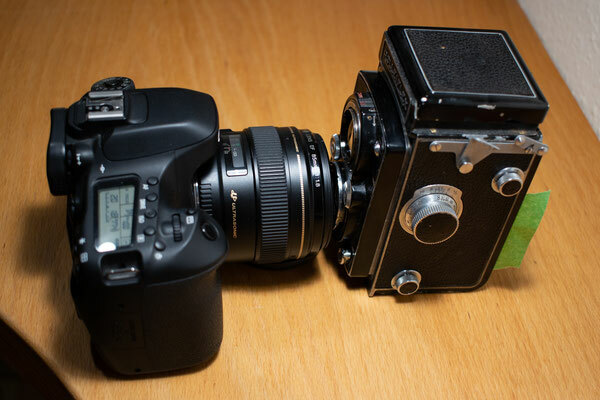 Adjust the focus on the TLR until you see a clear image on your digital camera (live view helps a lot). For the viewing lens, you will need the ground glass on the back and the shutter open, for the viewing lens you just need to open the hood. 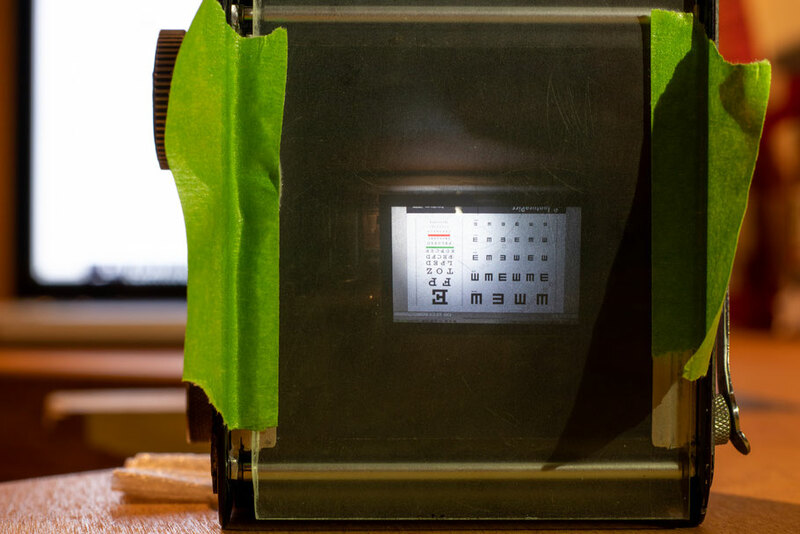 Shine a light on the ground glass or focusing screen to make it easier to see. When the both lens on the digital camera and the lens you are testing are at infinity focus, you will see a magnified image of the ground glass. I find it helpful to draw a couple of lines on the ground side of the glass with a pencil just to let me know if I am in the ballpark of focus. Use the digital zoom to fine tune the focus. Check the results against the distance scale. If the close focus is off, than most likely the infinity will be as well, but as the depth of field at infinity is much larger I spend more time checking the close focus.